Friends, I am coming off a most exciting, fun, and food filled weekend. I was lucky enough to participate in the IFBC (International Food Blogger’s Conference) here in Seattle. I found some of the content helpful, some of it inspiring, some of it not relevant to what I do, and some of it simply boring. Pretty standard for a conference, right? For me, the real value and the tremendous fun came in hanging out with some really wonderful people eating, drinking, laughing, and talking with one another. In addition to hanging out with old friends, I got to make some new ones including Megan from A Sweet Spoonful and Sarah from Lettuce Eat Kale. I am excited to know two more lovely women in the Bay area! And I finally finally got to meet Peabody. I kicked Randy and the boys out strongly suggested Randy take the boys up to Lopez so that I could invite some women to stay with me and he graciously accepted my suggestion. That freed up some beds in our house so that Cheryl, Tracy, Denise, Joy, and Kristina could stay at Hotel Dana Treat. I was so thrilled to be able to not only share our house with them, but also meals at some of the best restaurants Seattle has to offer. We had sandwiches and incredible views at Matt’s in the Market, perfectly proportioned toppings on perfectly charred pizza crusts at Delancey, and an unbelievable, no-holds-barred tasting menu at the new hot spot Staple and Fancy. I baked some treats for my fellow food bloggers (including these cookies) – of course I did – but alas, this strawberry cake was not for them. I actually baked this cake to bring to a Sunday night dinner with friends. Normally, I make something much more simple for a casual dinner – especially on a Sunday. But John and Lauren’s son Jaden is a dessert lover of the highest order and I feel it is my duty to keep sophisticating his dessert palate. Also, Randy and I had just celebrated our 8th anniversary and Randy loves strawberries. 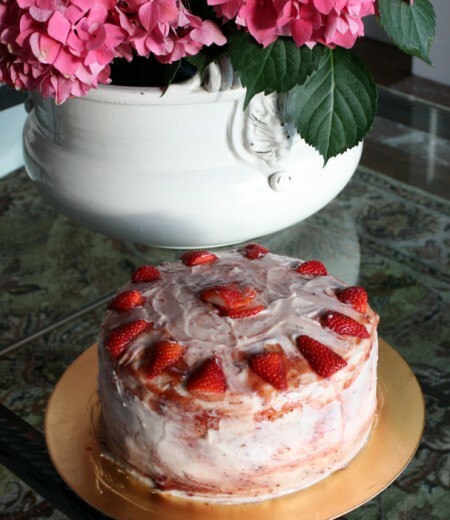 I don’t think I gave strawberries their due this summer so I made this cake for him too. As I mention on a semi-regular basis, layer cakes and I are not the best of friends. In general, they would not be invited to my birthday party (as my 3 year old is fond of saying). I would make an exception for this cake because it was very well-behaved. It is still a layer cake, meaning that the cakes need to be baked, split, and filled. Frosting needs to be made and the whole thing needs to be assembled without looking like the leaning tower of Pisa. 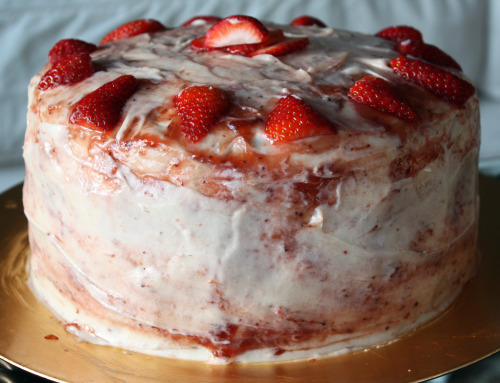 But the filling is nothing more than jam and fresh strawberries and the frosting is made from cream cheese and butter (no multi-step buttercream here), and really the whole thing was just a joy to make. And to eat. Whenever I make a cake like this one, I always make the cake part days ahead and freeze them once they are cool. I allow them to thaw out overnight before proceeding with the recipe. Using electric mixer, beat cream cheese and butter in large bowl until smooth, stopping to scrape down sides of bowl. Beat in sugar, then jam. Beat cream in medium bowl until peaks for. Fold whipped cream into frosting. Cover; chill until firm enough to spread, about 2 hours. Preheat oven to 325ºF. Butter and flour two 9-inch cake pans with 2-inch high sides. Sift flour, salt, baking powder, and baking soda into medium bowl. Using electric mixer, beat sugar and butter in large bowl until fluffy. Add eggs 1 at a time beating to blend after each addition. Beat in vanilla. Add sour cream; beat 30 seconds. Add flour mixture in 3 additions, beating to blend after each addition. Divide batter between prepared pans. Bake cakes until tester inserted into center comes out clean, about 50 minutes. Cool in pans on rack 10 minutes. Run small sharp knife around pan sides, then turn out cakes onto racks and cool completely. Using large serrated knife, cut each cake horizontally in half. Place 1 cake half, cut side up, on cake plate. Spread 2 tablespoons strawberry jam, then ¾ cup frosting. Top with ¾ cup sliced berries, arranging in a single layer. Repeat 2 more times with cake layer, jam, frosting, and berries. Top with remaining cake layer, cut side down. Spread 2 cups frosting over top and sides of cake in thin layer to coat completely. Spread remaining frosting over top and sides of cake. Stir remaining 1/3 cup jam to loosen. Spoon teaspoonfuls onto top and sides of cake, then use back of spoon to swirl jam decoratively into frosting. (Do ahead: Can be made 8 hours ahead. Cover with cake dome and refrigerate.) 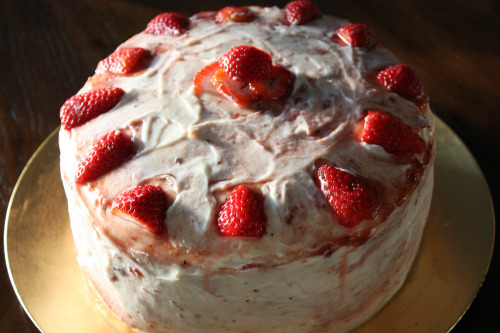 Serve cake slices with remaining sliced strawberries alongside. My husband calls my big dinners “Dana Meals”. A big dinner is a meal to enjoy primarily but it also is a meal to impress. Kind of the opposite of a weeknight meal. Mine tend to include multiple courses and multiple components. The ice cream usually matches the dessert. You know. Dana Meals usually happen on weekends spent with friends and/or family. Sometimes, when someone special is in town, I cook one during the week. Here is the problem. Let’s say you cook a really nice meal for a very cool and very appreciative person thoughtful enough to bring along his beautiful wife and adorable baby daughter. Let’s say that same person brings his whole work team over for dinner on another weeknight and you make an even more impressive and complicated meal. Now what if that person comes for dinner all by himself? On a Monday? You can’t exactly serve cold pizza, right? So a Dana Meal on a Monday it was. Now a couple of weeks ago, Randy informed me that there would need to be a Dana Meal on a Wednesday for a philosophy group he is a part of. Please don’t send me an email saying that if Randy needs a dinner for his club, he should make it. Theoretically that is correct. Philosophically even. But I know my husband and if the dinner was left up to him, cold pizza it would be. Randy is very good at lots of things but he does not cook. Truth be told. Everything in the markets right now is so amazing that food can taste really exceptional with just a bit of coaxing. Alongside the tart, I made a corn pudding that I loved and need to make as many times as possible before our fleeting corn season is over. I sautéed some zucchini in just a bit of olive oil and then tossed the coins with strips of basil, lemon juice, and Pecorino Romano. (This is my new favorite way to eat zucchini). I made that tomato and burrata salad that I know I will cry remembering in November. Not a ton of work and really delicious results. So let’s talk about the tart. If you happen to have tart dough in the freezer, this comes together very quickly. 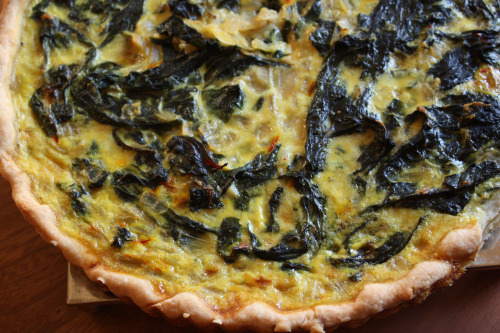 After a blind bake for the crust, onions are sautéed, chard is wilted, eggs and milk are whisked together, saffron and lemon zest are added, everything stirs together and goes into the tart shell, and 40 minutes later you have a tart. 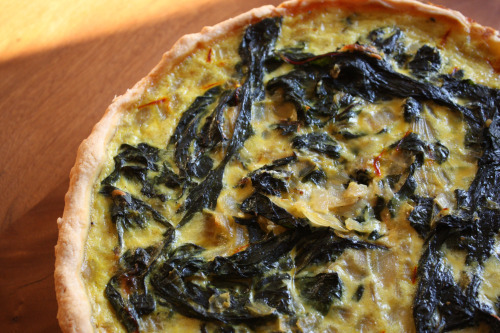 I happen to prefer my savory tarts warm and not hot, so this is a perfect dish for a dinner party. It can sit and cool while you attend to other details. Preheat the oven to 375ºF. Roll out one disk of dough to a 14-inch circle. Carefully transfer the dough to a 10-inch fluted tart pan. 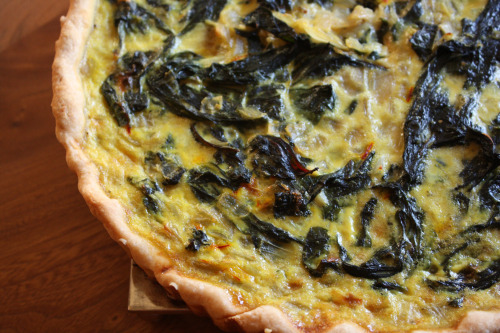 Fold the edges over on themselves to create a thick crust. Pierce the bottom of the dough with a fork in several places, then place in the freezer for 15 minutes. Line the pan with foil and fill with pie weights or beans. Bake in the oven until the edges of the crust are starting to brown and the bottom no longer looks doughy, about 25 minutes. Remove from the oven and set aside to cool. Heat the butter in a wide skillet; add the onion and cook it over medium heat until it is translucent and soft. Add the garlic, and the chard leaves by handfuls, if necessary, until they all fit. Sprinkle in a large pinch of salt. Turn the leaves over repeatedly with a pair of tongs so that they are all exposed to the heat of the pan, and cook until they are tender, 5 minutes or more. Make the custard. Beat the eggs; then stir in the milk, infused saffron, lemon peel, grated Parmesan, and a few scrapings of nutmeg. Stir in the chard and onion mixture. Taste and season with salt and a few grinds of pepper. Pour the filling into the prepared tart shell and bake until the top is golden and firm, about 40 minutes. Scatter the pine nuts over top before serving. Note: You will need only 1 disk of this dough for the tart so keep the other one in your freezer for next time! 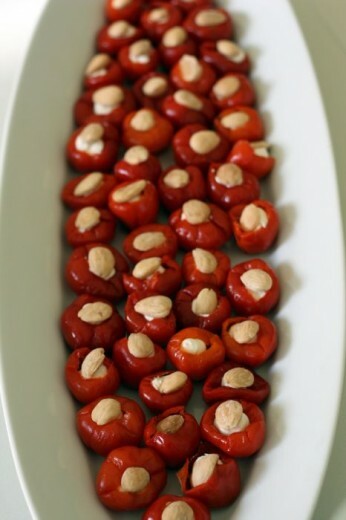 This is an amazing and super simple appetizer. The recipe is at the end of this post. Please allow me to tell you why I made them. But first a question. What would it take to get you to shave your head? I can imagine that for most of her life, my friend Kelly would have said nothing could get her to shave her head. She is a woman with a beautiful head of hair. It is her most striking feature and she has always had it cut to perfection. Kelly is not a high-maintenance woman but her haircut is always beautiful. She has that enviable hair that is straight but with enough texture to give it lots of body. In spite of this, Kelly is going to shave off her beloved hair. And she is doing it in celebration. Kelly has a son named Jackson and he is about six months older than my oldest son Graham. Five years ago, Kelly found blood in Jackson’s diaper. He was about 16 months old at the time. Visits to doctors’ offices and the hospital and tests revealed the unthinkable. Jackson had an aggressive tumor on his kidney. Immediately the ball started rolling – surgery to remove the kidney, chemo, radiation. His doctors were very frank with Kelly and her husband Gregg. This was a very nasty cancer and his road was going to be difficult. His outlook was pretty grim. Kelly remembers the pediatric oncologist saying that he would not be considered cured until he was 5 years past his diagnosis. At the time, with Jackson incredibly ill, five years must have sounded like beyond forever. Jackson’s treatment was very rough. He spent 69 nights in the hospital in six months. I remember Kelly calling me and talking about how difficult it was to get him to nap in a room with IVs in his arms and another very sick child sharing the same room. At the time I was struggling with my own napper and felt incredibly guilty for having such an easy problem. Once Jackson was stable, the family came over to our house for dinner. Jackson was pale, bald, and had a feeding tube. He had difficulty walking and not in the sweet way that a toddler should. It was absolutely heartbreaking and I sobbed as soon as they left. I had complete admiration for his parents. They were incredibly involved, on top of the doctors, and getting support from their community. Somewhere along the way in that very difficult first year, Kelly heard about an organization called St. Baldrick’s, a non-profit devoted to pediatric cancer. It started out as a couple of friends shaving their heads to support children bald from chemo, and has blossomed into the world’s largest volunteer-driven fundraising event for childhood cancer research. The only organization that funds more research is the U.S. government. All this money is raised by people who are willing to lose their hair in solidarity with a child stricken by cancer. Every year Gregg has shaved his head in Jackon’s name for St. Baldrick’s. Like other volunteers, he asks for sponsors, raises as much money as possible, and then goes under the clippers. Gregg is, ahem, follicly challenged so he does it to support the cause, but for him it is essentially a free haircut. Kelly is another story. She and her team of 45 other moms are going to shave their beautiful heads to create awareness for the good work St. Baldrick’s is doing and for pediatcric cancer in general. This is a big deal for a beautiful woman. It is an even bigger deal because she is doing to celebrate five years of Jackson being cancer-free. He has officially graduated from the Children’s Hospital program and no longer needs to go back for scans or tests. His story is an incredible one of beating the odds. Kelly and Gregg had a special party on Saturday night to celebrate and to offer thanks to friends and family who have supported them throughout this time. Also in attendance was one of Jackson’s pediatric oncologists, who is also benefitting from St. Baldrick’s. He is getting grant funding through St. Baldrick’s to fund research that he is doing at the Fred Hutchinson cancer reserach center in Seattle. When this party was first in its planning stages, Kelly asked if I could help with the food. Of course I said yes. 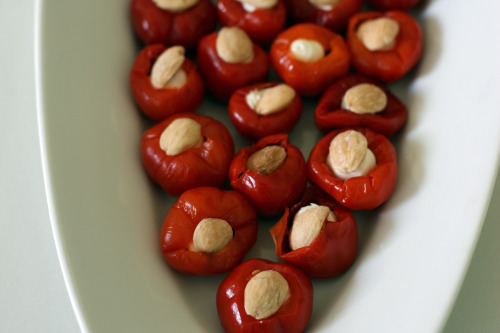 I made lots of different easy-to-pick-up appetizers including these stuffed peppadew peppers. Gregg tasted them at our summer party and they were first on his list of requests. This is such an easy recipe but it packs a powerful punch. Each bite is a perfect combination of heat, savory, creamy and sweet. Sometimes when I read posts about people who are doing great work in our world, especially work involving children, I immediately want to help. If you feel this way, I invite you to visit Kelly’s fundraising page. She has a personal goal of raising $15,000. To date she has raised $10,270. And one more thing about this amazing woman. She plans to not wear a hat or a scarf during her bald phase and also plans to wear a button that says, “Ask me why I am bald”. I love her. Each time I make this recipe, I make the cheese mixture and fill the pastry bag ahead of time and put it in the refrigerator. Then, before serving, I allow the cheese to come back to room temperature before piping. Drain the peppers thoroughly. Meanwhile, in a food processor or mixing bowl, combine the cheeses and mix until smooth. Fit a pastry bag with a plain tip, fill with the cheese mixture, and pipe into the peppers. Insert an almond into each pepper. Although I was a good eater as a child, I had a list of things I did not like. Turkey was at the top of the list. Closely following were mushrooms, zucchini, peppers, and eggplant. As I moved into vegetarianism and my taste buds grew up, I learned to love mushrooms in just about any form, zucchini almost all ways (not raw unless thinly sliced like this), peppers as long as they are cooked way down, and eggplant… Well, still working on that one. 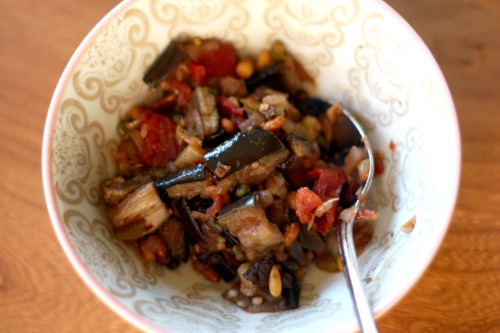 Caponata is the thing I tend to ignore on the antipasto platter. It stands between me and the marinated mozzarella or the garlicky mushrooms. So why did I make it? I have eggplant lovers in my life and this recipe comes from a most-trusted cookbook. 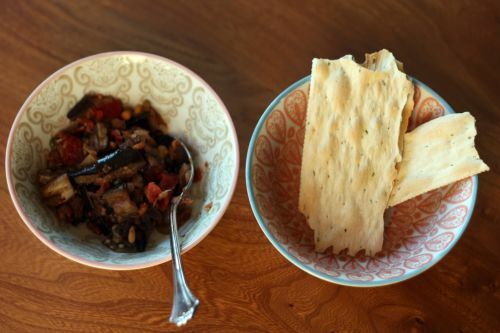 I made it during one of those weeks when I needed appetizers for several different things and this recipe makes a lot of caponata. It also keeps really well. I’ve tasted my share of them and this, in my humble opinion, is the finest version. Some are too salty, some are too sweet, and most are too greasy. John Ash finds the perfect balance here. Sweetness from raisins and a bit of brown sugar, salty from capers and olives, acidity from tomatoes and red wine vinegar, and not too much olive oil. It’s delicious with crackers or bread and I would head straight for it on my next antipasto platter. In the heading of this recipe, Ash mentions that you can toss this mixture with pasta too. Yum! Preheat the oven to 400ºF. Lay the eggplant slices on a baking sheet in a single layer. Roast for 15 to 20 minutes or until tender and lightly browned. Remove, coarsely chop, and reserve. I tend to like my green beans pretty plain. Like broccoli. I could pounds and pounds of those two veggies just steamed with a healthy sprinkle of salt. Maybe a squeeze of lemon. That is how my husband likes them too. But the green beans are so gorgeous at our markets right now. Plump, long, incredibly fresh. I felt like I wanted to celebrate their beauty more and make something a little more substantial. I found this recipe in my new Plenty cookbook but knew instinctively that some changes had to be made to the method. I was instructed to toss cooked beans, snow peas and peas in a warm spiced oil, then scatter crushed garlic, lemon zest, chopped chile and tarragon over the top. I don’t know about you, but crushed garlic and lemon zest don’t “scatter” too well for me. I wouldn’t welcome a big bite of raw garlic-laced green bean or a fuzzy lemon-zested one. I certainly am not interested in getting a big bite of jalapeño either. Instead of following directions like a good oldest child, I made more of a dressing including the juice of the lemon as well, and poured tossed the mixture with the vegetables. I am not a huge snow pea fan and would normally have substituted snap peas, but instead I just upped the green beans and threw in a diced avocado. The oil with crushed coriander seeds and mustard seeds really made this dish. I loved their smoky flavor and subtle crunch along with the tartness of the lemon. I guess I could eat pounds of green beans this way too. Fill a medium saucepan with water and bring it to a boil. Have a large bowl of ice water ready. Add 2 tablespoons of salt and then the green beans. 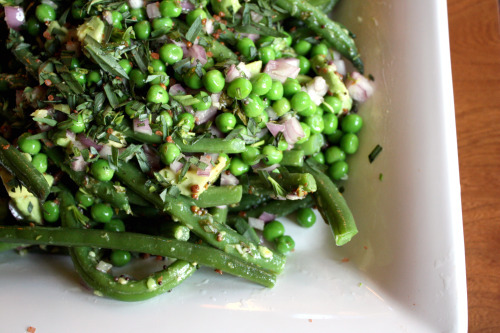 Cook for 3 minutes, then add the peas. After 30 seconds, scoop all the vegetables out into the ice bath, adding more ice if necessary. When cool, drain well, then place in a large bowl. Add the chopped shallots and avocado. Put the coriander seeds, mustard seeds, and oil into a small frying pan and turn the heat to medium. When the seeds begin to pop, remove the pan from the heat and allow to cool slightly. Meanwhile put the garlic, lemon juice and zest, chile, and tarragon in a bowl or jar. Add a large pinch of salt and a few grinds of pepper. Pour the oil over and shake or whisk to combine. Pour the dressing over the vegetables and gently toss to combine. 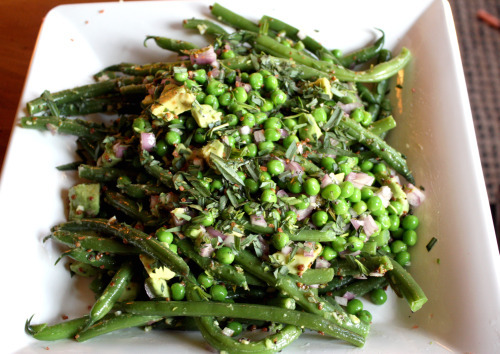 This dish looks best on a platter garnished with additional tarragon leaves.